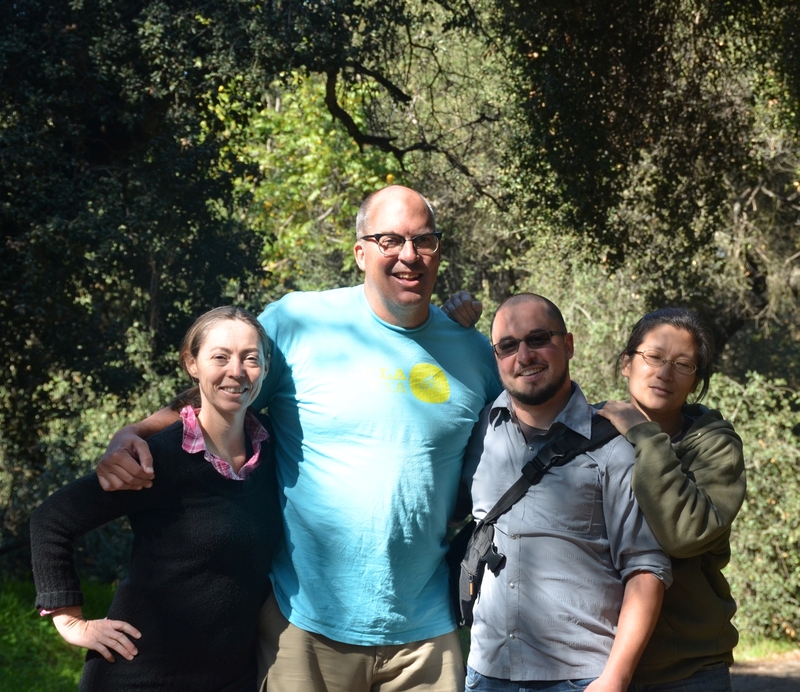 The four L.A. Creek Freak blog writers: Jessica Hall, Joe Linton, Joshua Link, and Jane Tsong. Earlier this week was a rare coming together of all four L.A. Creek Freak authors: Jessica Hall, Joshua Link, Jane Tsong, and Joe Linton. We all know each other, and run into each other at various functions, and keep in contact… but I think it may be the first time that all four of us spent good creek-freek time together. We’ve all contributed to this post – Joe did the compilation, so I’ve tried to weave and acknowledge… and any errors are mine. The occasion was a private tour of some of the historic creeks and canyons in the city of San Marino, and the adjacent southern border of the city of Pasadena. Our expert guide was Alan Jutzi, Avery Chief Curator of Rare Books at the Huntington Library, Art Collections and Botanical Gardens. Alan is the curator for the Huntington’s upcoming show Water Began It All, which Jane is designing. She wrote about here earlier. Water Began It All is open weekends November 19th, 2011, through February 18th, 2012 at the Flora-Legium in the Botanical Center. As Jane described, the show features the work of Michael Hart, who’s an artist but better known for running the Sunny Slope Water Company, located in Pasadena and the San Gabriel Valley. Hart is responsible for using existing landscape and historical documents to map out these canyons, creeks, zanjas and more. Michael Hart’s prints, including exquisitely detailed maps (much better than the roughly mapped google map below) will be available for purchase in the Huntington bookstore. Hart’s work was reviewed in last week’s L.A. Times Lost L.A. column by Sam Watters. The article is a good creek-freak read, and includes Hart’s piece, Old Mill in San Marino, a location that featured prominently in the tour this post describes below. The area we explored is part of the fascinating fault line that Jane has described beautifully in her excellent two part piece An Artesian Belt in San Gabriel (part I, part II.) The earthquake fault runs east-west across the San Gabriel Valley, more or less along Huntington Drive. The fault breaks up the gradual alluvial topography of the area, hence bringing water to the surface, including (historically): wetlands (cienegas), bogs, lakes, streams, canyons, oak woodlands, and more… leading later to a string of early dams, wells, zanjas, mills – dating back to the early days of the San Gabriel Mission. Read Jane’s earlier articles! One way to tell the fault’s change in the underlying land is to read the overlying pattern of the streets in this area. Pasadena’s broad alluvial plan supports a fairly regular grid network… which goes all fluey south of California Blvd, where the fault topography begins to be expressed. South of Huntington Drive (and even more strongly, south of the San Gabriel Mission), the broad alluvial plane (and now the regular street grid) reasserts itself. The map above shows the transition in the street grid. The area along the Huntington Library and just west of it was (and still sort of is) confluence of multiple creeks expressing themselves as fairly sharp canyons cutting north-south through the jutting east-west ridge. Note that, though there’s a lot of topography that’s fun for creek freaks to read in the public realm (ie: streets), the actual creeks run through private backyards… not accessible to the public. Today they’re largely culverted, underground… but it’s still very fascinating to track how they shape the landscape. Mill Canyon/Creek – the direct branch follows Kewen Canyon, below Oak Knoll Circle on Kewen Drive and onto the western portion of Encino Drive. The upper part of Mill Creek is Y-shaped including a western tributary along what is today Canon Drive (from Oak Knoll Circle to Kewen Drive.) More on the Old Mill itself below. Wilson Canyon – extends south east from the end of Wilson Drive at Arden Road. Mission Creek – extends from the lower Caltech campus along Arden Road (from California Boulevard to Cameron Drive) then south on Cameron Drive continuing south east where Cameron dead ends at Orlando Road. Further downstream Mission Creek is the east boundary of the Huntington. This creek land, perceived to be more nuisance than resource, changed hands between Huntington and his neighbor based on the outcome of card games. San Marino Creek – running through the Huntington’s Japanese Garden. Reminder: all of these creekbeds are inaccessible – located in private backyards in a very expensive neighborhood. We only saw them from afar – more reading the overall canyons than getting close to the watercourse. While we recommend checking out the street topography, please be nice and be respectful. Running perpendicular to these creeks/canyons, toward the south base of the ridge, is Old Mill Road, which was a road along a zanja that collected creek flows and shunted them east to the lake (called Wilson’s Lake or Kewen’s Lake) at what is now Lacy Park. Light bulbs went off in our heads – and Jessica was the first to say it – because the lake is located at the bottom of Pasadena’s Lake Street! So what’s now Lacy Park was the “Lake” in Lake Street. There was a natural lake there that was built up so that when it was nearly full, it would overflow eastward, over a shallow ridgeline, ultimately carried by a zanja to the San Gabriel Mission. Completed around 1816, the eponymous Old Mill itself has been preserved. It’s at 1120 Old Mill road and like nearly all great historic buildings, San Marino’s Old Mill has its very own web page. Lastly, and frankly pretty much unreadable in the contemporary landscape, is the site of the dam that pooled waters from pretty much all these creeks, for downstream use at the San Gabriel mission. The dam was located at what is today Kensington Road, just north of Huntington Drive. Landscapes of Obsolescence: As we were floating down an asphalt stream bed in a raft with seat belts, it dawned on me that at some point in time, someone deemed the stream that is now Kewen/Encino Drive to be obsolete as a means of conveying water. The stream that was once viewed as a resource to be diverted and captured was undoubtedly seen as a nuisance by future developers of the canyon. I’m not sure about the timing of events, but it seems to follow that right around the time the aqueduct was completed [in 1913], people’s concept of the value of local water sources really disintegrated. The engineering age definitely did a number on (already functioning) local stream systems. Hopefully there is a place in L.A. for a restoration age of sorts. Property Lines: I have always been a bit bewildered by the concept of property and the tour exposed some of the reasons why. It is so fascinating to me how people create and abide by the imaginary lines and boundaries that mark their personal territory. These lines are at once completely meaningless but in another sense so significant in that they determine the short-term fate of the land between the lines. For an example, take any one of the canyons/streams we crossed… in a very short distance a stream could be covered by a road, shoved in a pipe, capped by a swimming pool, converted into a formal garden, fenced off and marginalized, diverted to a mill for industrial use, dammed for irrigation purposes, and/or trivialized as something to wager during a game of cards. All of these different agendas for a stream that knows nothing of boundaries other than topography. Unfortunately, dear readers, recapping all this I realize that unless you live or work, or regularly walk, run, or bike in that portion of the city of San Marino, you probably won’t get the gist of all this from merely reading our overlong descriptions. Once you make your way through the landscape it should make more senese. Plan to go see the Water Began It All show at the Huntington, which will give you additional context and history… then print out the map and these descriptions (or view them on a smart phone) and bicycle or walk or drive some of these areas and enjoy tracing the ways that water moved and moves through these landscapes. I knew exactly where you were the whole time. What a fun post. I did this very same little journey many years ago before El Molino Vieja was restored and it was just derelict. I got chased out of someone’s private teahouse in a zen garden on that trip. That kept me away for awhile. Heh! That’s exactly what we’re urging folks NOT to do! hehehe… Check out these canyons and creeks from the street, please. Be respectful, and don’t fet us in trouble!! Glad you explored and connected with the area. I do hope that Alan Jutzi will organize a group tour. It has been discussed. When it’s scheduled we will certainly announce it on this blog and also on LA Creek Freak on Facebook. I live in San Gabriel and there’s a creek (deep and channelized) behind my house. Must be Mission Creek?? I’m basically on Pasqual Avenue, near the grammar school off West, before Las Tunas. What do you think? That’s actually the Alhambra Wash… which flows into the Rio Hondo at the Whittier Narrows. I think that Mission Creek was a tributary to what is today the Alhambra Wash… though it’s not entirely clear to me how the actual historic waterways correspond to the present day channels… which can be more engineered, and not necessarily what was there historically. Your description of these creeks is fascinating. Especially interesting to me is how you relate stream morphology and the surrounding terrain to the fault. Although the Los Angeles and San Gabriel Basins seem flat and featureless at first glance, with a closer look we see that they include very complex tectonic uplift and erosional features. One of my favorite is Cahuenga Pass, which is an uplifted gap in the Santa Monica Mountains through with the Los Angeles River flowed many thousands of years ago. The original Pasadena Country Club of 1897 surrounded Wilson Lake. Later it re-opened as the Huntington Golf Course with El Molino as the clubhouse. I think Wilson creek came down a bit west of Wilson north of Arden, through the lower Poly school. In the Google Earth view you can see a line of trees to the northwest of Cornell and Catalina. That is a partially concreted channel. I had lived on Catalina about 2/3 up from Cornell. A neighbor told me that they used to be able to walk down the channel to Lacey park. Our backyard would flood when it rained. Another neighbor told me that started when one neighbor filled in the creek to build his pool. You are currently reading Creek Freaks tour historic San Marino canyon creeks at L.A. Creek Freak.